This Cluster Fly Control Kit contains a selection of our best cluster fly killer products, including Pest Expert Formula 'P' Fumer Smoke Bombs, to enable you to carry out a successful cluster fly treatment. Provides long-lasting cluster fly control for up to 12 weeks! This Cluster Fly Control Kit contains a carefully selected combination of highly effective cluster fly killing products that will help you carry out a successful cluster fly treatment and eradicate a cluster fly infestation in your home. The Kit contains sufficient product for several cluster fly treatments to a standard roof space. In addition to fumigating Pest Expert Formula 'P' Smoke Bombs, which will flush out cluster flies in lofts, roof spaces and other areas, this Kit also includes the residual insecticides Pest Expert Formula 'C' Cluster Fly Spray, and Pest Expert Formula 'P' Powder, which offer longer-lasting cluster fly control. 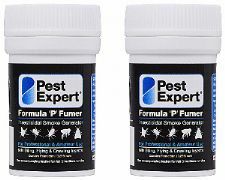 4 x Pest Expert Formula 'P' Fumer Smoke Bombs: Ideal for flushing out cluster flies from lofts, roof spaces or other areas of the home. Once lit, these cluster fly killing smoke bombs release an insecticidal (permethrin) smoke which will kill all cluster flies present at the time of treatment. One smoke bomb treats an area of approx 120 cubic metres. Two smoke bombs will treat a standard roof space. 1 x 1 litre Pest Expert Formula 'C' Cluster Fly Killer Spray: A highly-effective cluster fly killer spray that offers both fast-acting and long-lasting cluster fly control. For application to alighting surfaces including roof beams and window frames. Invisible insecticidal residue kills cluster flies on contact and maintains cluster fly control for up to 12 weeks. 1 x Pest Expert Formula 'P' Cluster Fly Powder 300g: A residual fly killing insecticide for treating alighting surfaces. Our Cluster Fly Control Kits are supplied with a professional advice sheet that gives you step-by-step instructions on how to use our cluster fly products to carry out a successful cluster fly treatment. Smoke Bombs should be used when you notice signs of cluster fly infestation as they have no residual value so will only kill cluster flies present at the time of treatment. I needed a fast solution to a potential cluster fly issue and this company provided a range of affordable options that were easy to use. The cluster fly kit with smoke bombs seemed like the perfect solution and it worked a treat! The kit had everything that was needed. It was easy-to-use and incredibly effective! Was at my wits end and have spent a fortune on various methods to rid my attack of cluster flies. Used the smoke bombs followed by spray and powder. After one use they have diminished by 95 per cent. Will use another smoke bomb soon to get the rest hopefully. Delighted.